I'm looking for a Firefox extension that will copy both the URL and Title of the current page to the clipboard. Ideally, this would happen when you press ctrl-c without anything selected. Adding a context menu for it would also be acceptable. I thought I used to have an extension to do this, but I can't find anything like it now. Copy on Ctrl-C: Sorry, no – that would interfere with pre-defined shortcuts. But as your second option names Context Menu: Yes, definitely. Copies title and URL of current page: Sure. In different formats. Even by formats you define. So here come the goodies. 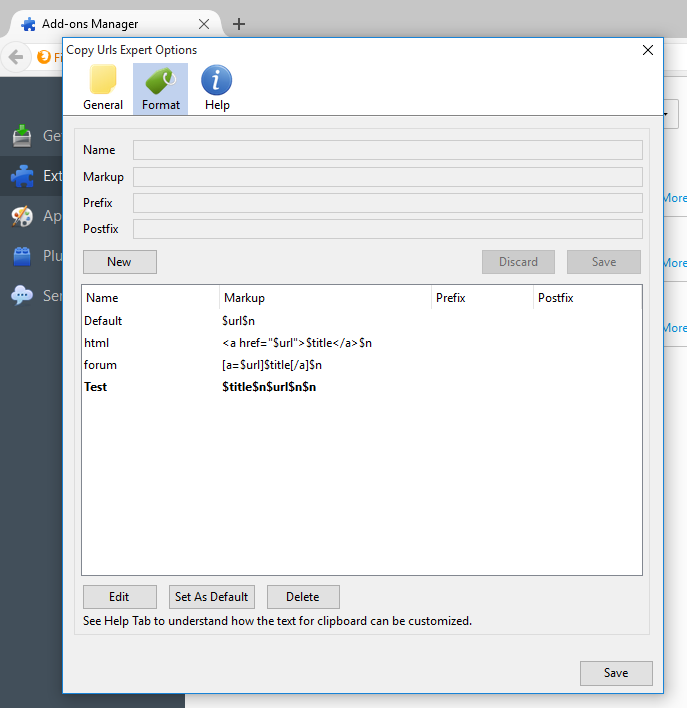 First, it is operated via the context menu. The first image below shows how it looks like when there is some link selected; if there's not, "Copy Link Text..." simply reads "Copy page title and address". But the sub-items are the same. In the sub menu you see you can copy it in different formats. 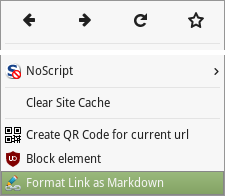 The latest version comes pre-configured almost as the screenshot shows, just FuseTalk has been replaced by Markdown, so it's fine for Stack Exchange. I'm using CoLT for several years now, and I'm a big fan of it. The addon never let me down, runs stable and fluent, never caused any trouble – and I'm a frequent user of this addon, so I must know :) I couldn't do without it anymore, it's always one of the first addons I load to a fresh installation / new workplace. I can recommend it heartily. You can't use Ctrl+C to copy, Easy Copy uses Ctrl+Shift+Y instead. Unfortunately, there doesn't seem to be an option to configure custom shortcuts, but I could be wrong. You can also add various templates in the extension settings, in addition to the ones that come with the extension, even one that prompts you to enter text, which is then set as link text instead of the title (the "Notes Link" template). You can use various variables while making new templates (with "%[variable]%"), an overview of the available variables is here: How It Works - Smoky Ink. There are some template ideas over here, such as a Markdown template, a JIRA/Confluence template, etc. A demonstration of various templates can be seen below. You can also copy all open tabs. Via a workaround, you could copy your bookmarks in this way. First right-click on your bookmarks folder, then click "Open All in Tabs", and then use Easy Copy to copy all open tabs. 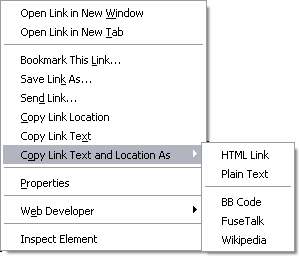 You can configure if you'd like some things to be omitted from copied link text, such as ": Add-ons for Firefox". 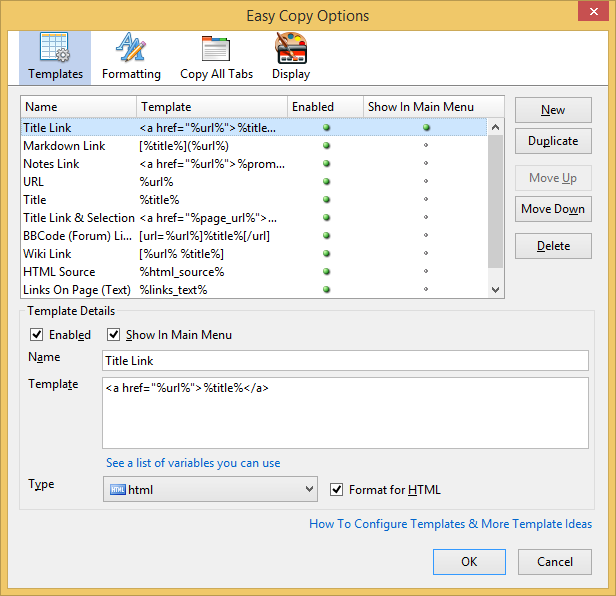 I recommend Copy Urls Expert, a good balance in terms of customization and ease of use. 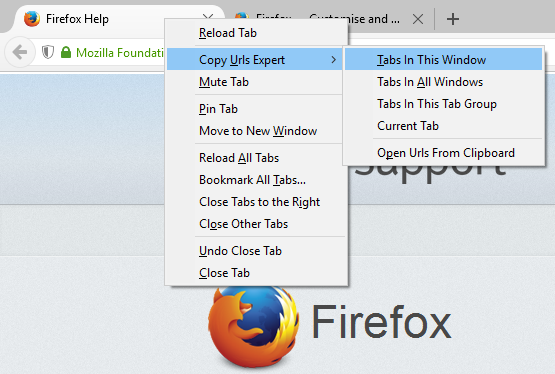 I needed a Firefox extension that could copy the web address (URL) of each tab into the system clipboard. Copy Urls Expert fits my needs and it matches the OP's requirements as well, so I've decided to add it to the answers. Copy multiple urls (links) to the clipboard. 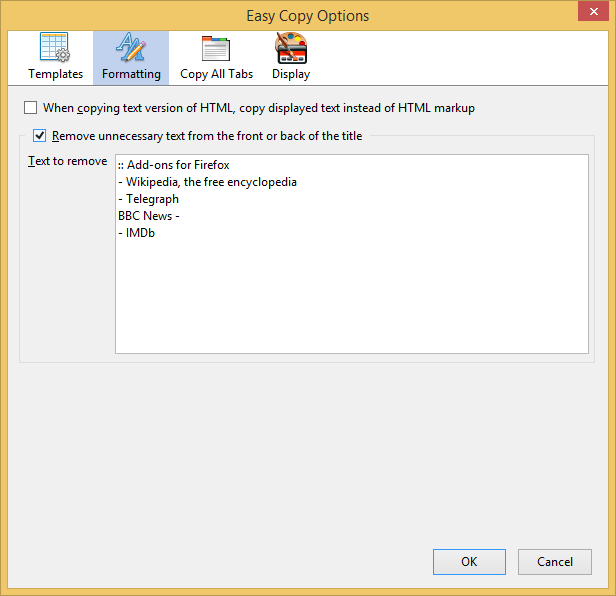 Provides options to copy urls of all opened tabs and urls in selected text. 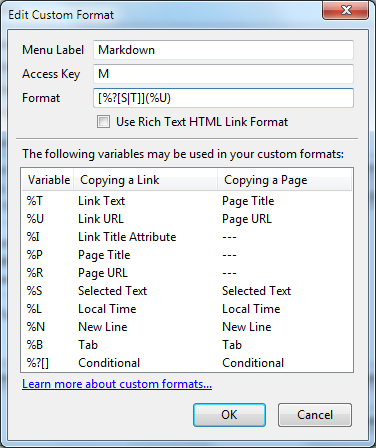 You can customize the format of copied urls. 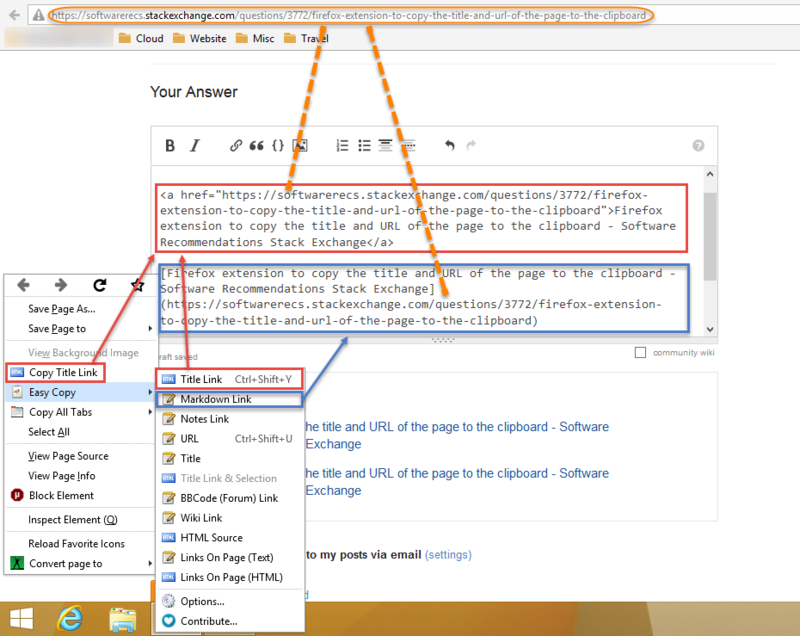 You can also open multiple links from clipboard. As shown in the previous image, the output can be easily customized to the format required. I found the one that I remember. It is called Copy Fixer. It is also available for Chrome. There is also Copy Title and Description that adds a context menu for copying the page title, meta description, and meta keywords (but not URL). As my answer with CoLT is only valid for Firefox < v57 (and CoLT won't be maintained anymore), a good replacement is Format Link: excellent support by the dev. Again, no Ctrl-C directly on the page, but a context menu is available. There's also a toolbar button available which lets you edit the captured text, and switch between the formattings. Next to some preconfigured formats, you also can define your own. 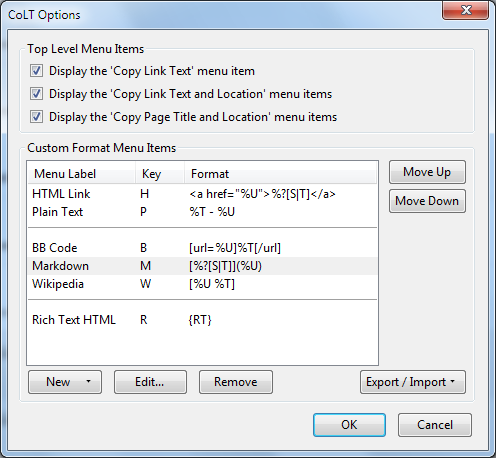 For the context menu you can either have your preferred format as single entry, or a sub menu with all configured formats. Unfortunately, not both at the same time – again a limitation of Mozilla's WebExt API. 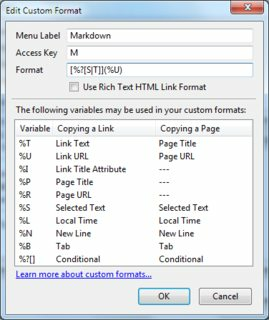 A Plus of this addon is: If you mark some text anywhere on the page, and then use the context menu to capture the URL (either of a link on the page when right-clicked on it, or of the entire page when right-clicked in an empty area), the marked text will be taken as description for the link. Note however that none of the new WebExt stuff can work on Mozilla's own pages. That's not the fault of the AddOn devs, but of Mozilla locking that (in the API and on their site). Remember that compared with the previous API, WebExt is very limited – and many AddOns lost functionality. 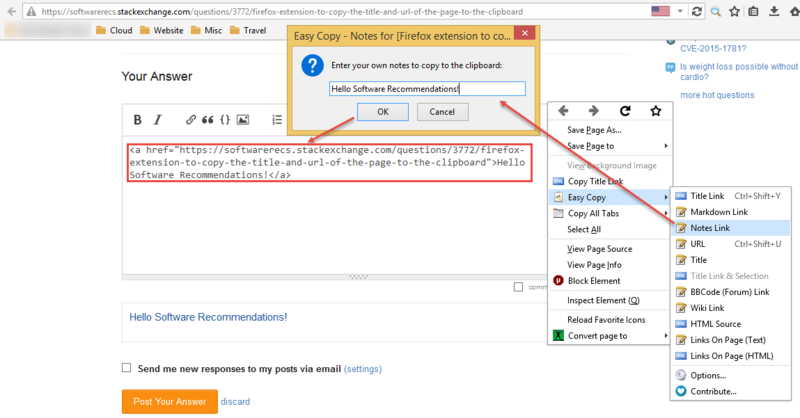 Firefox plugin to un-Google-fy links and copy them to the clipboard/pasteboard? Is there a proper addon for Firefox which keeps browsing history forever?